Come on a journey of discovery to Cyimbili where a picturesque island forms the backdrop to the full life cycle of coffee: you can watch the entire process from seeing coffee beans growing on the bush to a delicious cup of locally grown and made coffee. But first we travel gently along the shoreline soaking up the quiet and beautiful scenery. Near Cyimbili we find lovely views of the coffee islands from the water. Day 1: We start at Paradise Malahide from where we will follow the coast south past the famous Rwandan hills. travel gently along the shoreline soaking up the quiet and beautiful scenery. Near Cyimbili we find lovely views of the coffee islands from the water and can optionally go on a short paddle around them in the afternoon. The guest house is run by Alarm-Rwanda that is promoting reconciliation in the local community. They also sell their excellent coffee! Day 2: Turning north, as we head back the active Nyiragongo volcano looms large ahead of us all day. We sometimes stay close to the shore however, if the weather is good, we occasionally paddle out deep into the lake to get the best views of the volcano as we slowly make our way back to Paradis Malahide. As we arrive, it will be hard to believe that we're back again, was it only yesterday that we left? At Cyimbili there is a small guesthouse with rooms and a campsite. We will make reservations for you. However, accommodation and food as well as any additional activities are not included in the price charged by Kingfisher Journeys. We will loan you a few free dry bags for your clothing. Sunset and fishing boats at dusk: Included for free - if it is possible on the day, we go back on the water in Cyimbili to witnessing the best spectacle on Lake Kivu. 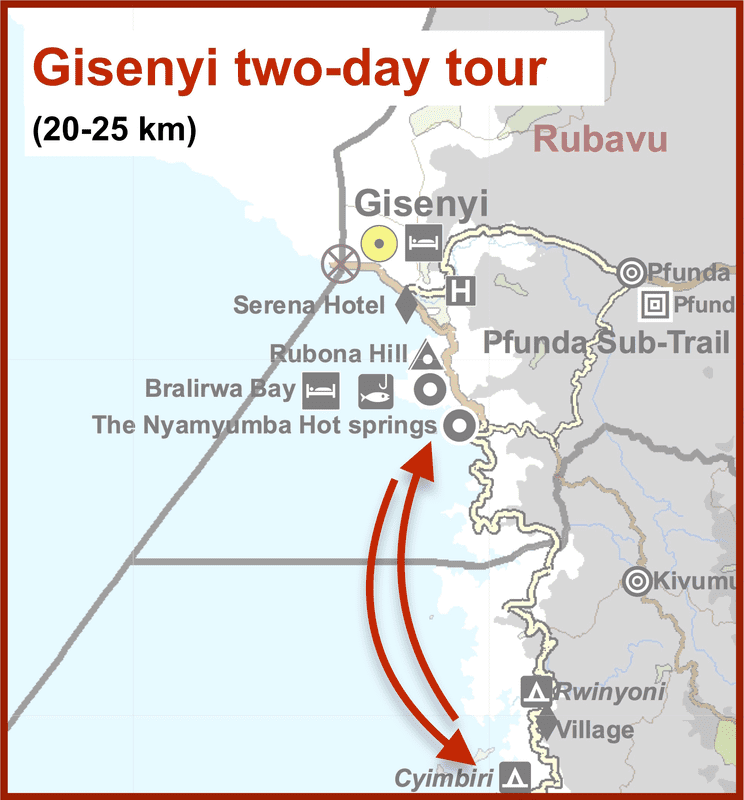 Make sure to bring a packed lunch as there is nowhere to buy any food once you have left Gisenyi.